From the largest publicly traded production firms to small local companies, home builders are at the epicenter of many of today’s most pressing political issues. Across the U.S., residential building pros deal with some of the country’s biggest challenges and opportunities: immigration, taxes, environmental regulations, banking, and Wall Street reform, to name just a few. 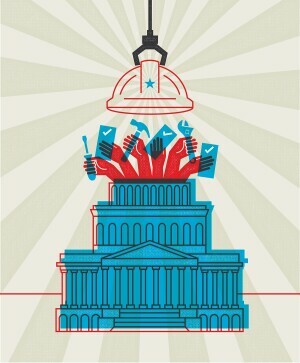 November’s midterm elections will help to shape these issues, and the stakes are high: Up for grabs is the entire House of Representatives, a third of the Senate, and 36 governorships. In what many political insiders consider a bellwether year for U.S. politics, home builders plan to make their voices heard. A recent BUILDER poll found that nearly 99% of respondents said they plan to vote in the upcoming elections, and more than three-quarters of them said home building–related issues will play a large role in their decisionmaking. Before U.S. builders hit the polls they’ll have to sort through the current political climate, with its rampant party extremism, constantly changing balances of power, robust regulatory environment, and Supreme Court upheaval. In such uncertain times, many will look for guidance from the NAHB, which has long lobbied on behalf of the industry and, in 2016, began to support and endorse political candidates for Congress. (It does not endorse candidates at local or presidential levels). Founded in 1942, the NAHB’s mission is “to protect the American dream of housing opportunities for all, while working to achieve professional success for its members who build communities, create jobs, and strengthen our economy.” The association’s members construct about 80% of the new homes built in the U.S. every year, and the federation has more than 800 state and local associations throughout the country. NAHB lobbies on topics from forest management to energy policy, and it issues statements on initiatives from tariffs and codes to Supreme Court justice changes. Staff members also keep tabs on what’s going on in government agencies that deal with housing—a total of 160 federal housing programs administered by 20 different entities at a cost of over $160 million each year, according to independent educational nonprofit Restore Accountability. The association has a seat at the table at nearly every level of the legislative process, all the way up to the executive office. For instance, when President Donald Trump recently signed an executive order telling the EPA and Army Corps of Engineers to rescind or revise the Waters of the United States (WOTUS) rule, then-NAHB chairman of the board Granger MacDonald was by his side. In fact, it’s said that politicians ignore the home building industry at their peril; one Fox News announcer recently quipped that he’d rather have the NAHB with him than against him. Tobin and his team of 10 lobbyists and 20 government affairs staffers are the soldiers who navigate the tricky terrain in the nation’s capital, working with regulatory agencies such as HUD and the EPA, the White House, and the judiciary on behalf of NAHB’s members. Keeping track of so many issues is no small task, Tobin says. “So many things impact the ability to develop housing in America,” he says. Tobin starts his day by absorbing what’s driving the news cycle—sometimes a statement from House Minority Leader Nancy Pelosi, often a presidential tweet. After internal strategy meetings at the NAHB’s National Housing Center in downtown D.C., just a few blocks from the K Street hub where Beltway lobby shops have traditionally clustered, Tobin treks over to Capitol Hill or the White House for meetings with members of Congress who could either sign or block legislation on everything from banking regulations to environmental protection. On any given day, Tobin’s team can be tracking 100 different bills. Al Diaz/Miami Herald/TNS via Getty ImagesDonald Trump addresses NAHB members in Miami Beach, Fla., during his 2016 presidential campaign. “Everything is almost a No. 1 priority when it comes up,” Tobin says. NAHB staff looks at every piece of legislation and change in regulations as soon as it is released and takes immediate action, no matter how unlikely it is to become law. If a bill were introduced to cut the mortgage-interest deduction in half, for example, Tobin’s team would be on it. “There’s no way that bill would make it through Congress, but we will take that bill with one co-sponsor, send a letter, lobby against it, and make sure there are several nails in that coffin so it never sees the light of day,” Tobin explains. Every two years, Tobin and his staff prepare for shifting sands in Washington, D.C. If Democrats take over the House in the upcoming elections as some predict, Tobin’s staff will need to know the priorities of the new leadership and discern how they fit in with the NAHB’s agenda. “We’re always war gaming what the next two years are going to be based on what the current situation looks like,” he notes. NAHB’s lobbying efforts are determined by senior officers who represent the nearly 2,500 members who serve on the association’s board of directors, in turn representing NAHB’s 140,000 members. NAHB relies on its members to provide relationships with elected officials, which is why it created the Bringing Housing Home program to develop opportunities for its members to meet with congressional delegations. Local NAHB leaders are encouraged to schedule meetings with their senators and representatives during congressional recesses. 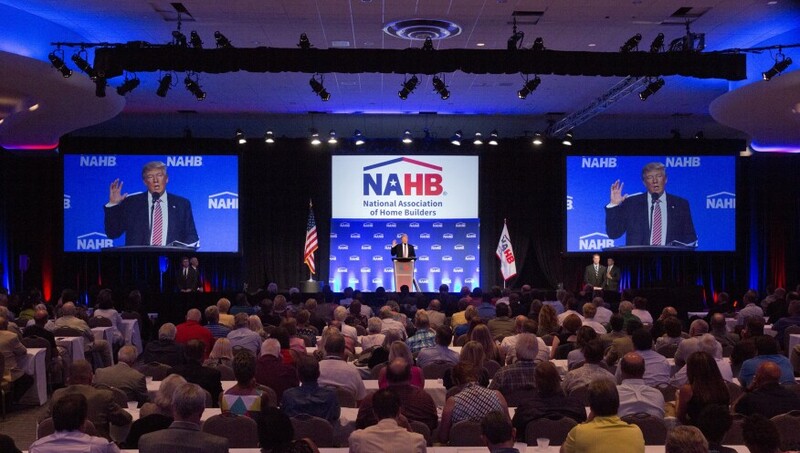 NAHB members held hundreds of these meetings across the nation this spring and summer. 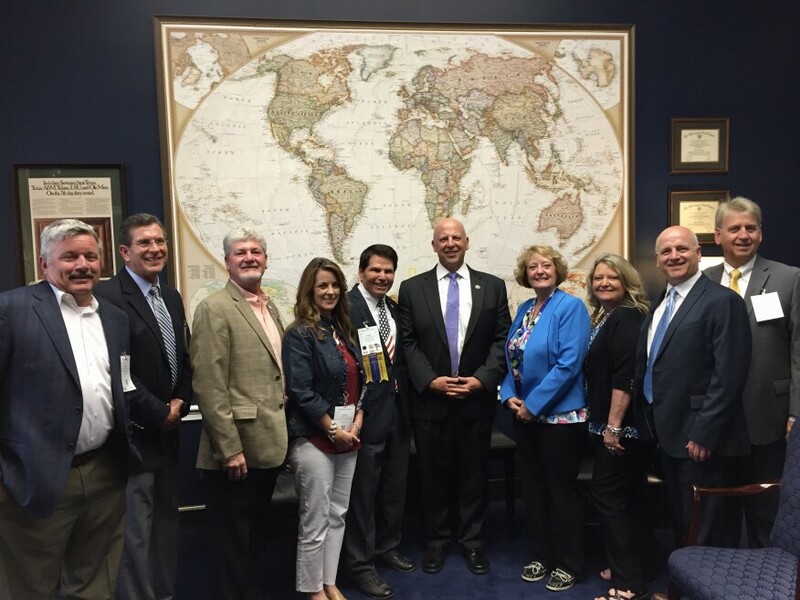 Courtesy Kevin WoodwardHome builder Kevin Woodward (third from left) and other NAHB members meet with Tennessee U.S. Rep. Scott DesJarlais (fifth from right). Home builder Kevin Woodward has seen the importance of one-on-one political involvement. Early in his career, the managing partner for Legacy Homes in Nashvillerealized that laws and regulations could make or break his industry and saw that the only way to have any control over them was to get involved in the political process. For decades, Woodward has been part of lobbying efforts, serving twice as state president of the NAHB in Nebraska and three times in Tennessee. He has also been on numerous NAHB committees and is currently the third vice chair of the NAHB’s BUILD-PAC, meaning he will be chair in two years. NAHB offers an advocacy app with an interactive congressional directory to keep members informed of housing news, statistics, and talking points on key issues, but most use “the old-fashioned way of communication—texts, phone calls, and emails—for our calls to action,” Woodward says. When issues come up, NAHB Board of Trustees members send a directive to state leaders, who disseminate the information and enlist help from members. While NAHB’s government affairs office steers the ship in Washington, members back home truly drive the organization, says vice president for intergovernmental affairs Karl Eckhart, who oversees NAHB’s grassroots efforts. When members asked for more ways to support pro-housing candidates aside from BUILD-PAC, the association delivered. In 2016, NAHB made its first endorsements of 139 congressional candidates—94% of whom won their races—and launched the Defender of Housing Award for U.S. senators and representatives who have offered unwavering support for the housing sector. NAHB members have given 268 awards so far. The criteria for what constitutes a pro-housing candidate takes many factors into consideration, and the selection process is intense. Woodward and other state leaders spend hours scouring candidates’ records and talking with people about congressional members and candidates before they offer a Defender of Housing award, donation, or endorsement. One politician who has earned NAHB’s support is Rep. Keith Rothfus, a PennsylvaniaRepublican who was recently named a Defender of Housing. In Rothfus’ district, the home building industry employs 130,000 people and drives other industries such as raw materials, design services, and furniture sales, and he’s fierce about making sure home builders can do business unencumbered. He’s a vocal opponent of over-regulation, particularly when it comes to community banks, and as vice chairman of the Subcommittee on Financial Institutions and Consumer Credit and a member of the Financial Services Committee, he has some sway. As influential as the home building industry is in Washington, it’s not immune to the fact that money talks. Completely funded by donations from more than 2,700 members, the association’s BUILD-PAC has more than $3 million to spend this election cycle, and Tobin plans to use every dime. The Center for Responsive Politics, which tracks PAC spending, shows that as of Aug. 21, BUILD-PAC had contributed $979,000 to more than 300 candidates for the House and Senate, 86% of them Republican and 14% Democrat. The PAC has also contributed $240,000 to the national parties and $439,032 to committees, including $60,000 each to the National Republican Congressional Committee, the National Republican Senatorial Committee, the Democratic Congressional Campaign Committee, and the Democratic Senatorial Campaign Committee. This entry was posted in Bedford and tagged Bedford NY Luxury Homes, Bedford NY Real Estate, elections, U.S. home builders on October 10, 2018 by Robert Paul.